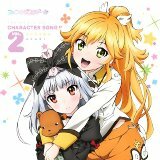 This CD contains character songs for the TV anime Fantasista Doll. Songs by Tsuda Minami (津田美波), Hasegawa Akiko. Vocals of the remixes by Ohhashi Ayaka (大橋彩香), Tsuda Minami (津田美波), Tokui Sora (徳井青空), Akasaki Chinatsu, Ohhara Sayaka, Hasegawa Akiko.